Ladies, I attended to my first hackathon last weekend, specifically the FinCapDev Hackathon. Don’t worry, I stayed fabulous and didn’t wear a hoodie. But, I did meet a lot of cool people that are creating apps to improve financial literacy. The group of hackers was inspired by The Center for Financial Services Innovation’s Financial Diaries of low-income American families. Hackers were asked to create apps to relieve the pain points of these families, most importantly creating stability out of income instability. The winning app was Be Thrifty, an app that facilitated the purchase of items in bulk to then be dispersed among the group who pulled their $$ together. With Be Thrifty, I can team up with my neighbors to buy the 100 roll pack of toilet paper that I have always wanted to buy because of the great deal, but lacked the space to store all of those rolls. Sign me up! The second place app and hacker’s choice award was Naptar. It was a calendar that amalgamated everything one needs to know when unemployed (government assistance resources) and looking for work (job postings and skill-building classes). And third place went to DoLoCo that enhanced the local giving community with its app. It was noted that low-income family prioritize donations to their community and this app formalized this already informal process. 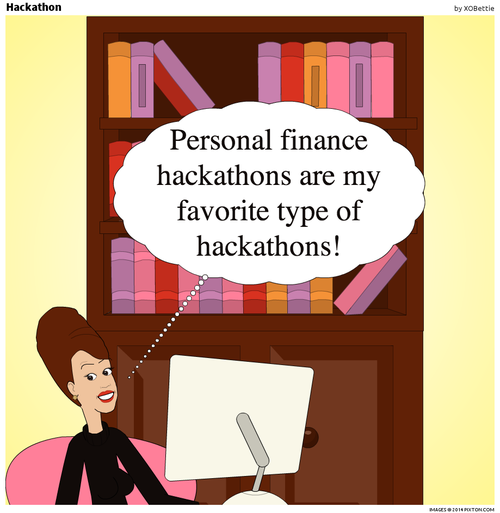 I know that there will be many more hackathons in my future, especially when they are personal finance-themed. Hope you’ll join me!